Barcelona, January 18, 2018. 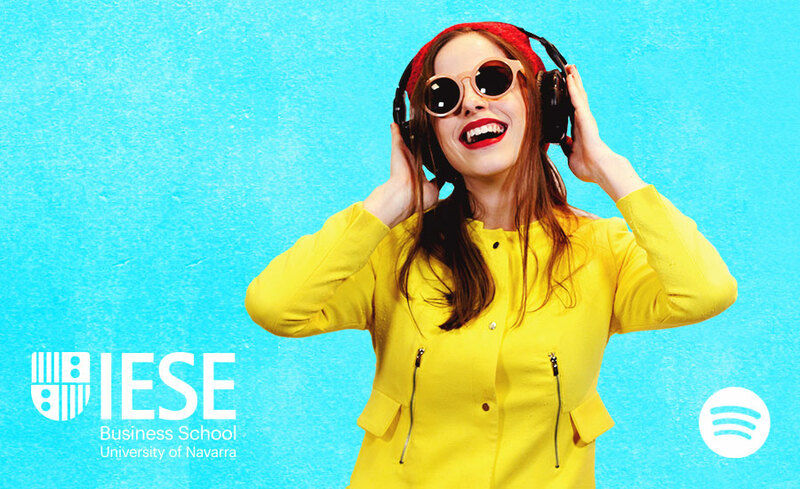 – IESE has joined Spotify, becoming the first business school on the music streaming service and giving any member of the IESE community the chance to add to playlists for everyone to enjoy. For the moment, IESE has four playlists: “Time to (case) study”, “Positive leaders”, “Run with it!”, and “The spirit of IESE”. Students, professors, staff and alumni have contributed songs to the lists, creating a channel that’s by everyone and for everyone, and where anyone can “listen” to IESE in a dynamic and different way. Through Spotify, the more than 45,000 current and past students and participants can share their musical tastes for each moment and mood. Time to (case) study: Ideal for students looking to boost their concentration by listening to relaxed music by artists such as Ludovico Einaudi and Yann Tiersen, among others. Positive leaders: Brings together chart-topping pop-rock tracks from recent years, with bands like U2 and Coldplay. Run with it! : A list intended to get you moving, with artists such as Imagine Dragons and Bruno Mars. The spirit of IESE: Music that anyone from the IESE community feels best represents us, featuring positive and inspirational songs like “Forever Young”, “Heroes” and “I Believe”. Each list now has between 20-30 songs, and more than three hours of music. The channel is available through this link or by searching “IESE Business School” in the Spotify app.